I've come so far since being a new mommy. If this party would have taken place years ago, under the "Martha Stewart does it all perfectly and well and so should I" regime that I followed, I would have treated the whole party quite differently. It has taken time and more children, especially more children all at once, to stop expecting perfection in a world where children live and thrive. It has taken years to learn how to pick and choose what is important to me every day: either a clean floor or clean dishes, either child-made Christmas cards with glue dripping off the card or perfectly made cards that require days to assemble. I have to choose daily. I've learned to ask myself the same question: What do I want? Right now, what really matters? Especially since the twins have been born I've stopped constantly doing things just because I think they are expected of me. For example, I rarely send Christmas cards. Just not a priority. Should I stress over having a Christmas dress for all the girls for church? 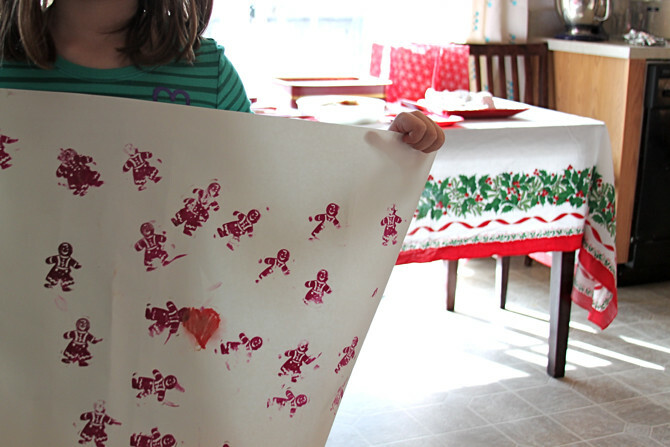 Or the fact that making gift wrap for the party was a last minute thought and not "the coolest project ever"? Or that I ran out of time to tidy my basement and everyone saw it yesterday? If I'm not careful, what I believe others expect of me will deaden the light in me, the light in my children. There have been times when I've tried to be everything for everyone, but nothing true to myself. As if weakness, a messy house, or a disheveled child mean I've gotten it all wrong. Well, I can tell you now that after four children have entered my life and totally changed my world as I see it, that I don't have it all wrong. The disheveled child running around with her clashing lime shirt under her plaid Christmas dress most days knows what really matters. The children that make the mess hour by hour in my house know what matters. And this "imperfection" I honestly believed was weakness is beautiful, rather, holy to me. This "imperfection" has stopped me from looking around me, constantly wondering if I'm doing it all right and rather, has had me focus my sights down below, right where they tug on my pants when they want to be held, where they twirl below me and laugh because life makes them happy. Because they only know doing what makes them happy. And so I strive for that happiness, although I'm not as good at it as they are. It's the reason I've decided to hold off The Sleepy Time Gal shop for a little bit longer, the new year. If anything even begins to encourage stress, I reconsider the timing right away. And now, instead of finishing projects for the shop in my spare time, I've spent calm nights on the couch with peppermint tea and good conversation. Ask yourself: Right now, what really matters to you?